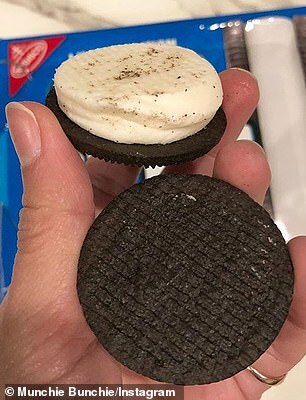 The latest variety of Oreo to hit shelves is a concoction that many kids have been making at home for years: two cookies and lots and lots of extra creme filling. 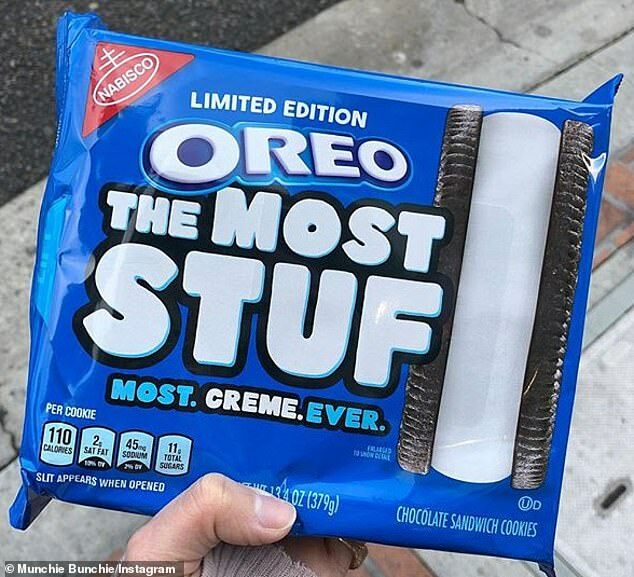 Nabisco released the limited-edition ‘The Most Stuf’ Oreos in stores this month, enticing shoppers with cookies that boast roughly three or four times more creamy filling than regular Oreos. That means they come with more than twice as many calories per cookie — and have left sweet-toothed shoppers divided. Nabisco revealed that it was working on creating the new version of the snack back in October 2018. Appearing on shelves for the first time earlier this month, the cookies caught the eyes of shoppers who were eager to see what the new Oreos would taste like. 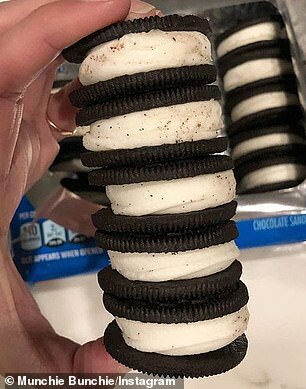 Each cookie appears to have roughly three or four times more filling than regular Oreos, as well as a significantly higher calorie content of 110 per cookie. Even Oreo Double Stuf cookies, which have extra creme, are 70 calories each. Meanwhile, the recommended daily intake of calories for the average woman is 2,000 calories per day, and the recommended amount for the average man is 2,500 (when trying to maintain weight), according to Health Line. According to reports from people on Twitter, the cookies appear to be available in store at various Target, Walmart and Rite Aid stores. Instagram user and L.A.-based foodie MunchieBunchie shared a photo after she tried the cookies for the first time on January 12. ‘HOLY! Is this not everyone’s dreams coming true? !’ she captioned the picture. ‘Limited edition Oreos… THE MOST STUF with the most creme ever! This is beyond incredible… like beyond. ‘I honestly almost fainted to the floor when I opened the package! These are so fat!! You gotta be that person that eats the creme by itself to enjoy these (hi me). It’s so much that after only two or three cookies and you’re tapped out. ‘Super sweet…I’m sure you can imagine! But no one is ever complaining about too much Oreo stuf! LOVE LOVE LOVE! Highly recommend if you love the stuf! 10/10 because THE MOST EPIC!’ she added. She wasn’t the only one to be excited and impressed by the the latest Oreo invention, and more people shared their positive reviews on Twitter. 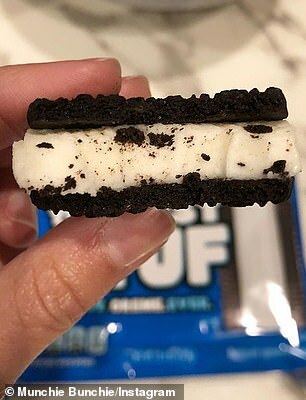 ‘The best thing about these Most Stuf Oreos, is that you can lift the center right out of the cookie and leave the cookie parts. I may or may not have practiced this today,’ added @DolphinCubMama. Another Twitter user, @wonkybonkers, referred to the cookies as ‘sickeningly awesome’. However, the Most Stuf Oreos didn’t go down so well with others, some of whom dubbed them ‘disgusting’. ‘Probable unpopular opinion, but while I absolutely LOVE Oreo I feel like the Most Stuf ones have TOO much cream! I’m good with a double stuff. (Oh by the way, that doesn’t mean I didn’t eat them! ),’ wrote @GinaGJ725. ‘Just had a Most Stuf Oreo. Can confirm they are disgusting and disappointing and not at all how an Oreo should be eaten,’ added @anniemyachen. 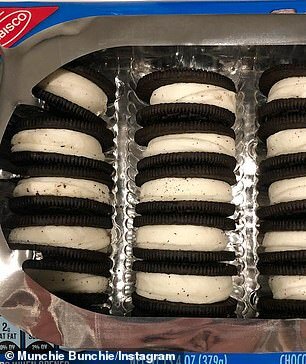 The arrival of the Most Stuf Oreos comes after a Butter Popcorn version of the popular cookies was teased on social media earlier this month. Instagram user The Junk Food Aisle posted a photo of mock-up packaging for the new flavor on the social media platform on January 4 after getting to try one. The photo was accompanied by a caption that read: ‘Coming Soon! Buttered Popcorn Oreo! Weird but true: I got to try one of these last month without being told what flavor it was, and I would have put all my money on it being “Pineapple” after just licking the creme. The Junk Food Aisle Instagram account keeps followers abreast of new sweets and snacks, and often gets to preview treats before they come out. Emmerdale spoilers: Joe Tate return IMMINENT following unexpected Debbie Dingle clue?